Overview : A true universal VGA box compatible with the new generation consoles on todays market (Xbox 360, Playstation 3, Wii) and also with Xbox. Compatible with both PAL and NTSC system, it is available with European or US power supply. A plug and play installation will give you Ypbpr input with all consoles, now with a 1080p resolution! Compatible with PAL or NTSC system. Double scan conversion (31.5KHz for NTSC, 31.25KHz for PAL,67.5KHz for 1080p). Connect compatible YPbPr device to your VGA monitor. Integrated YPbPr to RGBHV converter. Supports 480p, 720p, 1080i, and 1080p. Applications: TFT LCD monitor, CRT monitor, Set-top box, Display projector. Works on LCD TFT monitors. Automatic video source mode detection (film/graphic). Get the power from USB port of consoles or PC, no extra power supply needed. Comes with 3 component cables - PSX3, Wii & XB360. 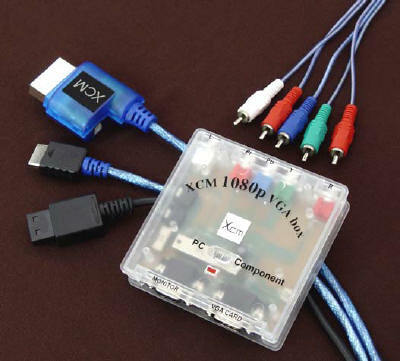 Quality/Usability : The XCM 1080p allows you to hook up your PS3/Wii/Xbox360 computer monitor via VGA. With all the new consoles and the ability to output into high-definition, and the high costs of HDTV's, not everyone has them. But we actually do...our computer monitors. Unfortunately, no VGA cable was included. This was probably due to cost factor. Had XCM included the cable, price of the product would of been higher. So to keep the price down, they didnt include the VGA cable. Like all cables that XCM releases, they are sturdy and high quality cables. You will not be disappointed. The VGA box itself is also sturdy and well built. The outer casing is made of opaque clear plastic. The connectors are standard quality and nothing special. Something caught my eye though. Under the VGA CARD slot, although the connection is a male connector, there was a female type connector. This connector uses the two screws similar to that when you're connecting your monitor to your video card on your PC. You can see it in the image below but on the mock up images, you dont see it. To fix this problem, simply remove the shield around it so that you can connect the cable. Before purchasing this product, you must know that the VGA box does not change the output resolution. So you should check your monitor to see if it supports the resolution you are going to be used. Connecting everything to the VGA box is fairly simple and is explained easily in the instruction manual. On top of the box is a switch that allows you to switch between VGA and COMPONENT. The front has a MONITOR and VGA CARD port. On the back, it has YPbPr inputs. To the left are SOUND IN, SPEAKER OUT and 480p~1080p/1080i switch. And on the right side is the USB POWER port to power the VGA box. All images looked crisp and I didnt have a problem with any of the consoles. Just remember that the Wii can not upscale images as it is not capable of doing so. Conclusion : Overall, the XCM Universal YPbPr 1080p VGA Box is a useful product for those who do not have HDTV. It would of been great if they included the VGA cable as the box allows you to switch video signals. So you can use video signal from your console or connect to your PC's video card to output to your monitor. Its understandable that they left it out to keep costs low. If you have an extra VGA cable around the house, you wont have to worry.